A White Coral Gemstone is formed from generation after generation of calcium carbonate exoskeleton growth by marine polyps. Red and White Corals have attracted attention as Gemstones for their durability and intense colours. These can be found in coral reefs across the world, especially near the coasts of Australia and the USA. Coral has always been associated with sacred powers. Ancient Egypt, Greece and Anglo-Saxon Europe revered its use. It was used in early days in ships to ward off pirates and 'sea monsters'. It was a major point of trade between the Mediterranean and Indian coasts. Even the early Norwegians used it for decorating their weapons. It is used even now in Europe and Scandinavia as a protection against evil powers. Today The Australian, Mediterranean and American coasts are great producers. The gemstones are almost always found at the bottom of the major oceans. While the medicinal benefits of powdered White Coral is known in alternative medicine therapies, even the use of white coral as jewelry (in rings, bracelets, necklaces, pendants etc.) has proven beneficial to its wearer. 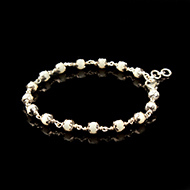 O When worn, the stone promotes balance and resonance in the wearer's life. O It strengthens body's immunity. 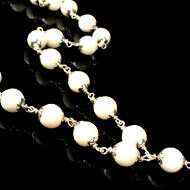 O It also helps in bonding and interpersonal relationships. Wearing a combination of Gemstone and Rudraksha is the best way to make the most of it. Rudraksha Ratna Science Therapy® (RRST®) devised by Neeta Singhal makes the use of both White Coral gemstone and Rudraksha beads. It is a holistic healing therapy that uses the curative and healing properties of Rudraksha and Gemstones to balance and energize chakras. In RRST we deal only with natural and un-treated gemstones. The reason Rudraksha Ratna Science Therapy is widely acclaimed by many is that it works on chakras, the very basis of life and is a holistic therapy that heals from deep within with absolutely no side effects. In RRST setting of a gemstone, as a ring or as a pendent, the bhasm made of the planetary herb is kept inside one tube and the metal that improves the planetary effects, is kept in another tube. In case of White Coral, Basil/Neroli Bhasm and metal Platinum are used to attract the cosmic power of Uranus. The gemstone is then energized with its precise seed mantra on a specific day to empower it to eliminate all the malefic effects of the planet and reinforce its beneficial effects. Thus the gemstone becomes a powerful talisman suitable to be worn by any person irrespective of his birth chart. During consultation, the blocked chakras that are causing the mental, emotional and physical issues are identified and limiting beliefs are addressed. Chakras become imbalanced when your thoughts and attitudes tend towards fears and negativity when facing challenging situations in life. Blocked Chakras manifest emotional disorders and physical ailments. It is only after blocked Chakras are balanced and activated that you can transform your life of suffering, obstacles, and confusions into love, success, and happiness. As per the chakra status and concerns of the client, a suitable combination of Gemstone and Rudraksha bead is recommended. As per the cosmic colour they emit, the gemstones work on specific chakras. 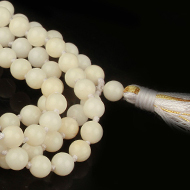 White Coral works on Sahasrara Chakra and the RRST Consultant identifies the correct finger position for drawing maximum energy from the stone. Rudraksha and Gems are powerful agents of energy and work on releasing the negative energy stored in the form of stress in the blocked chakras, thereby activating them and tuning them to their natural state. Sahasrara Chakra is the seat of “Light”; it signifies and governs our highest self and the door to the unconscious and subconscious. This chakra links us to the divine Sea of Light / the Kingdom of Light, out of which everything has emanated. This chakra is directly aligned to seek an intimate relationship with the Divine. It is the power of prayer, the intent. It is also our “grace bank account,” the warehouse for the energy we amass through kind thoughts, actions and acts of faith & prayer. It enables us to gain an intensity of internal awareness through meditation and prayer. This chakra represents our connection to the transcendent dimension of life. It is the primary route for liberation. Once this Sahasrara Chakra is realized, rebirth in the world of illusions is no longer necessary. When this Sahasrara Chakra is blocked/imbalanced, people do not see the meaning of life, nor do they believe in the existence of the Divine. For them, life is just a coincidence, some molecules that came together and developed life on this planet. They feel no connection or guidance from a higher power and feel unworthy of spiritual help and abandoned by the Divine. One tends to suffer from migraine, tension, headaches etc. Even though the White Coral Gemstone is quite durable, it isn't the hardest of minerals, so extra care should be taken towards it. The Stone should always be brushed with a soft cloth, and shouldn't be exposed to chemicals or detergents. Your Gemstone might routinely carry negative energies, and the pendant or ring can be detoxified by dipping it in water overnight. 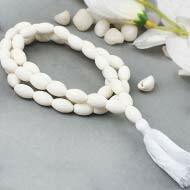 O A person feeling abandoned, lonely or finding no meaning in life can wear a White Coral for fulfilment. O Best for spiritualists, Sadhaks and Meditators. It can be worn on Tuesday in the morning after bath. 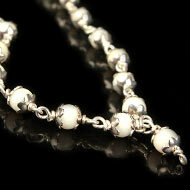 If need be, one may additionally chant the seed mantra “AUM” 108 times before wearing.